Read the Nostradamus Code book in which the hidden timeline of World War III is revealed. You will read about Osama Bin Laden, the next major terrorist attack on the US, war with Iran, the nuclear destruction of Rome, a confrontation between the US and China/Russia, the relocation of the Papacy, and great detail on the timing and the course of World War III. The years 2010 through 2012 are explained in precise detail. 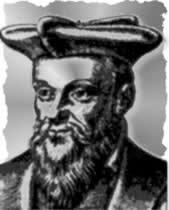 Referred to by Nostradamus as the Time of Troubles, you will read hundreds of startling revelations regarding this era. The Time of Troubles is full of war, despair, and evil, but there will be a new beginning answering the hopes and promises of many.